This is my first post on this site as i just got a 2007 STi from an uncle. I am kinda new to this kinda stuff so any help on the question below would be great. Currently the Intercooler water is running out and the light is comming up on the dash. I have looked into the trunk and found the little box, my question is how do i take it apart to refill it? I didnt want to force it and break it and there is nothing in the Car manual. Any help would be greatly appreaciated! You should have a tank that looks like the image below. If so you you'll need to find where the filler cap is hidden. 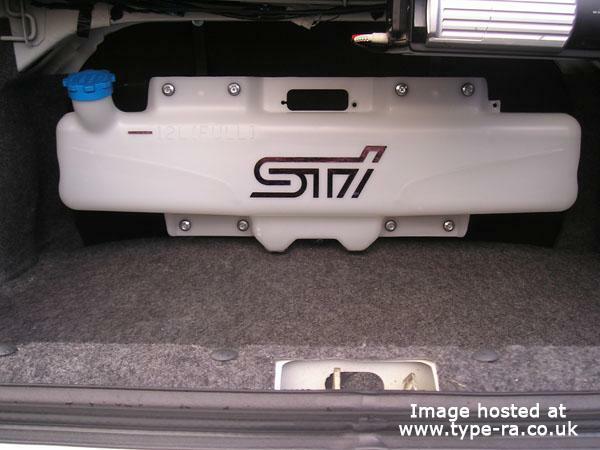 If you can't and you take a pic of your boot, may be able to help you Unfortunately pic below is the new age I/C water spray tank retro-fitted to a V3 STi RA, never looked into the boot of a new age STi I'm afraid. Hope that helps. mine is hidden under the boot lining, at the right hand. it has a screw off lid. de-inonised water only. perhaps the us model is different ? thnx guys im going to cherck this tonight. worse comes to worse i will post a pic.